DESCRIPTION: Khaled Abou El Fadl is a classically-trained Islamic jurist, an American lawyer and law professor, and one of the most important Islamic thinkers today. In this updated and expanded edition of The Search for Beauty in Islam, Abou El Fadl offers eye-opening and enlightening insights into the contemporary realities of the current state of Islam and the West. Through a "conference of the books," an imagined conference of Muslim intellects from centuries past, Abou El Fadl examines the ugliness that has come to plague Muslim realities and attempts to reclaim what he maintains is a core moral value in Islam-the value of beauty. Does Islamic law allow, or even call for, the gruesome acts of ugliness that have become so commonly associated with Islam today? Has Islam become a religion devoid of beauty, compassion and love? veil, sexual abuse, wife-beating, terrorism, bigotry, morality, law, and the role of tradition. Abou El Fadl argues that the rekindling of the forgotten value of beauty is essential for Muslims today to take back what has been lost to the fundamentalist forces that have denigrated their religion. 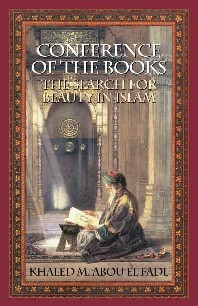 The original volume entitled, "Conference of the Books: The Search for Beauty in Islam" was published by the University Press of America, an imprint of Rowman and Littlefield publishers. It was published in Hardback and Paperback editions. 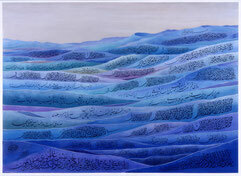 Many of the original chapters of the first edition first appeared as articles in The Minaret Magazine, a circular published by the Islamic Center of Southern California in the 1980's. The new and updated edition entitled "The Search for Beauty in Islam: A Conference of the Books," was published by Rowman and Littlefield and included 22 additional chapters along with an updated preface. "...El Fadl attempts to offer interpretations that are humanistic and accommodating to modern values, yet simultaneously challenging for traditionalist scholars and preachers." "This highly original book is in part a dialogue with Muslim scholars in the past, and, in part, a hymn to an enthralling vision that 'beauty' is to bring life to the truth of the Prophet. The dialogue shows the enormous breadth of [the author's] reading in classic works of learning by Muslims, and his vision suggests a new spiritual esthetic, which is both inspiring and challenging." 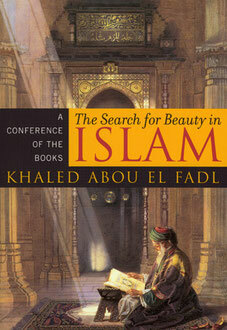 "Khaled Abou El Fadl is emerging as a major Muslim voice for the twenty-first century. Conference of the Books is an excellent introduction to the ideas, insights, and reflections of this important scholar of Islam and Islamic law, author, and poet." "Dr. Khaled Abou El Fadl, the most important scholar writing on Islamic jurisprudence and its development in the American context today, sets a high standard here for legal discourse and practice among North American Muslims." "Each independent essay may be read in any order, but collectively they illustrate richness and diversity." "The Conference of the Books is a collection of studies in the ethos of the Islamic intellectual heritage and the contemporary Muslim reality. The studies presented in this book arose from my encounters, as a jurist and teacher, with Muslims in the United States and other parts of the world. The essays were written in response to actual recurring problems in the Muslim community that are directly relevant to the moral and ethical definition of Islam in the contemporary world. 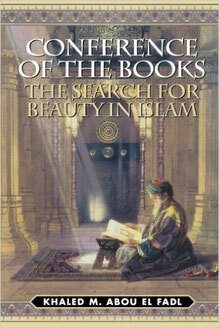 The range of topics addressed in this book is quite broad; among others, the topics include censorship, political oppression, terrorism, the veil and the treatment of women, marriage, parental rights, the role of Islamic law, the dynamics between law and morality, and the character of the Prophet Muhammad. The range of topics was dictated by the types of issues raised by the people I encountered, as well as by my own spiritual and moral development. Therefore, there is a noticeable evolvement in these essays, and I leave it to the reader to decide on the direction and merit of this evolution.